I did not think I was going to have time to spin today. That’s how crazy it was, even after getting up at 7:00 (without an alarm) because I was thinking about how much stuff I had to get done today. All my cooking for the week – kale, eggplant casserole, crusty bread with cheese and garlic, blue cheese coleslaw, fried cabbage with sausage, roasted chicken, plus packing lunches for 5 days and tomorrow’s snacks. And I had to have everything done by 2:30 so I could shower so we could get to the Little Yellow Music House by 4:00 for this month’s house concert. The concert was great, it was John Moreland. I had not heard his music before and I loved it. Loved him. But the secret joy? Most of the time, the main performer does two sets and we don’t get home until 9. Tonight, he did one longish set and we were out of there and home by shortly after 8:00. 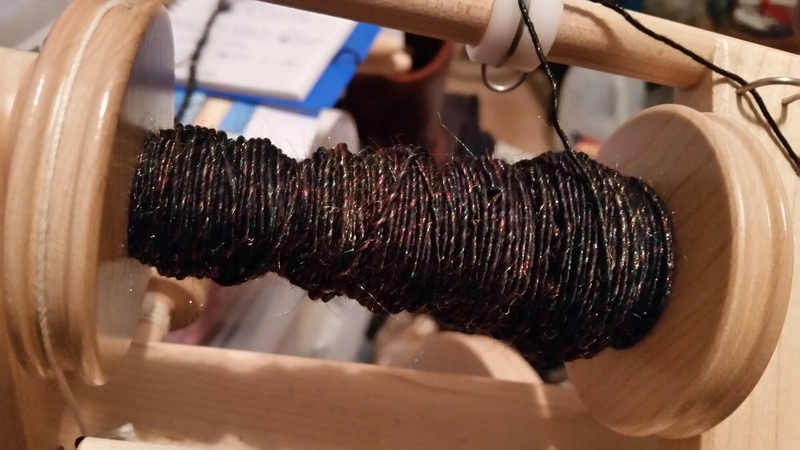 So happy happy, I got to sit at my wheel and spin more of this beautiful sparkly merino-bamboo-firestar fiber after all. And still get to bed early. Which is where I’m headed next. Until tomorrow. This entry was posted in Art, Fiber, Life and tagged Healthy eating, Honesty, Real Food, Spinning. Bookmark the permalink.